Paphos is a city in Cyprus, located in the south-western part of the island, on the Mediterranean coast. According to legend, it was here that the goddess Aphrodite appeared from the foam and water. The population is 35 000 people. The date of foundation is 300 year BC. Город Пафос – это исторический и культурный центр Кипра. Занесён в список всемирного наследия ЮНЕСКО. В XNUMX году Пафос был культурной столицей Европы. Во времена Римской Империи являлся столицей острова. Место во многом оправдывает своё название, поскольку город действительно довольно пафосный и здесь любят останавливаться состоятельные люди. Rest in Paphos is suitable for active people, and those who are far from noisy companies and nightlife. Everyone will find a place for themselves. The only thing, the city is not so successful for family rest with the child, because there are practically no children's playgrounds and animation programs. And pebbly beaches do not contribute to children's games on the coast. The number of flights depends on the season. In the low season there are no charters, and regular flights are much smaller. From Moscow, fly about 4 hours. But from the end of April to October quite a lot of daily charters not only from Moscow, but also other cities of Russia. There are three ways to get from Paphos airport to the city. The bus stop is located on the airport. Route № 612 goes to the tourist part of the city, and № 613 in the historical. cost of travel - 1,5 euro. From Paphos airport, it is most convenient to take a taxi to the hotel. The booking desk is available in the arrivals area. The machine can also be caught directly at the exit from the terminal. If you plan your trip in advance, a transfer from the airport can be ordered through the Internet. In this case, you will be met at the airport with a sign, help with luggage. And also you can choose the type of vehicle and order a seat for the child. 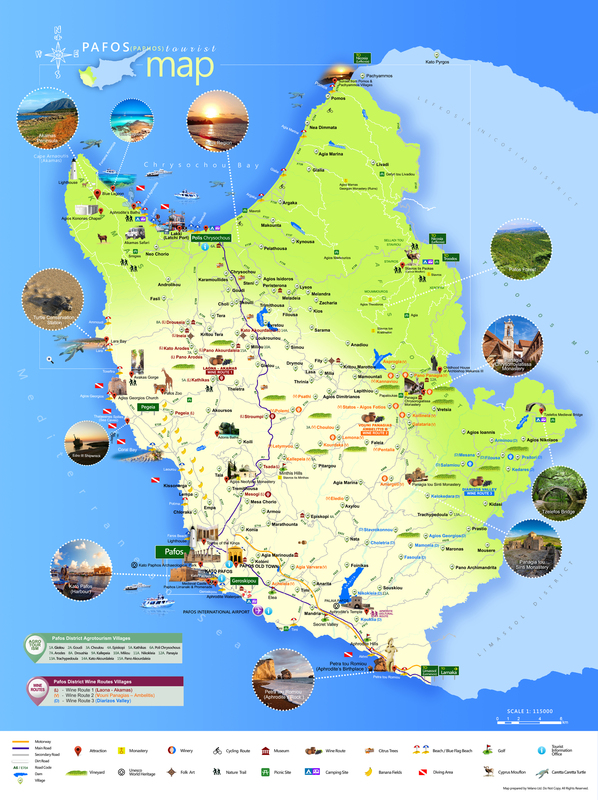 To enable you to explore all the corners of Cyprus, we recommend renting a car. This can be done immediately on arrival, at the airport, where the largest selection of cars and rental companies. We recommend booking a car in advance, because there are a lot of people who want to go on a high season. Within the city limits of Paphos and the surrounding area you can move to buses. Directions is 1,5 euro, the ticket is purchased directly in the cabin. Also you can buy a travel card for 1 day for 5 euro and a week for 15 euro. At night, the price increases to 2,5 euro per trip. Taxis are available in the city and the surrounding area. From the airport, this is the easiest way to get there, especially if you have large baggage. Transfer can always be ordered via the Internet. This sightseeing bus and it is possible to tour all the attractions of Paphos. Total 11 stops. The cost of the ticket for the day: 12,5 euro for adults and 5 euro for children. You can exit and stop at any stop of the route. Among the attractions of Paphos, every curious traveler will certainly find something for himself. To nature lovers we advise to take a walk in the pine forest, the healing air of which gives strength and confidence. On the outskirts is the Turtle Farm, the Aquarium and the park, where you can see some exotic animals and birds. In Paphos there are both sandy beaches and pebble beaches (the latter are larger). Everyone will find something to their liking. There are quite lively zones, and there are small and small coves. Many of them were awarded the Blue Flag for its cleanliness and developed infrastructure. All the beaches of Paphos are municipal and the entrance to them is free, only sun loungers and umbrellas are offered for a fee. It should be borne in mind that on some beaches the entrance to the water is complicated due to rock formations. The most popular beach is Coral Bay. It is most comfortable (there are taverns and restaurants on the beach), and families with children like a gentle entry into the water and the fact that it is sandy. Nearby is Corallia Bay - the best place for surfers. The most beautiful is Lara beach, and there are two of them and are located on both sides of the Akamas peninsula. Since they are adjacent to the reserve with green turtles, here there are no hotels, no sun loungers, no umbrellas. To get here is not so easy, so people on the coast a bit. In the bay of Petra tu Romiou there is a place from where, according to legend, the goddess Aphrodite emerged from the sea foam. The beach itself is pebble and inexpressive. The climate of Pafos is Mediterranean. From November to March, a lot of precipitation, but in the tourist season, there is almost no rain. In summer, the average temperatures are + 27 ... + 31 (the water warms up to + 26), in winter + 13 ... + 15. The season lasts from April to the end of October. The best time to visit is May and October, when not so crowded and comfortable weather conditions (not too hot). Paphos is the most expensive resort in Cyprus in terms of hotels. It is here that a lot of 4-x and 5-star hotels. Strangely enough, but expensive and fashionable do not always have a good entrance to the water, but in some 3-star - just an ideal place for swimming. This happened because the city in its time was more oriented to the Germans, who prefer to swim and sunbathe next to the pool, rather than on the coast. Therefore, if convenient access to the sea is important for you, then ask about it in advance, even before booking. If you want to save on living, it is worth staying away from the beach and not in hotels, but in guesthouses and apartments, where prices are always lower. Prices tend to increase from low to high. The largest selection of housing can be found at booking.